Inspired by my grocery store trip after my honeymoon I am sharing a few ideas on visiting the grocery store that I hope will make cooking easier, grocery shopping quicker, and will help you save money too. Here goes part two (read part 1 here). First off I try to always have a list; even if I just scribble it down on the back of the cable bill five minutes before I leave for the grocery store at least it’s something. I do a quick inventory of the basics like olive oil, eggs, milk and coffee just to be sure everything we really need is on that list. Most of the time I have an ongoing grocery list on a note pad in the kitchen that anyone in the family can add to when they want or need something. They are supposed to add anything that they use the last of to the list too, but that does not always work out perfectly, so the inventory method is a good idea. Last, I make sure I have my re-useable grocery bags, I love them they are must buy if you don’t have them yet. Makes loading and unloading the car so much nicer. It’s time to hit the road. I am picky about my grocery store while I wish I could go to Whole Foods every week but it’s not in the budget nor is it really practical, sometimes you want a box of normal Triscuits. So I recommend that you try out a few different stores (even all the same brand) you will see each one has its strengths and weaknesses. 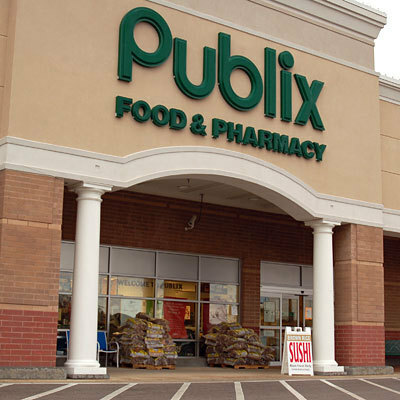 For me the small Publix close to the house has lot of older folks as customers so fruit and veggies abound and staff is nice, but the lunchbox goodies are slim pickings and the other customers move very, very slowly. The big Publix a little farther away is best for mega shopping trips when I will need everything but the kitchen sink including kids snacks, cleaning stuff, and wine. Get to know the stores near you. Also don’t overlook the value of Target, Costco, Wal-Mart or local specialty markets. They all have good things about them and if you are going to be in the store anyway adding the right food items to your cart is a win-win. I always think of items as fitting in a category: proteins, produce, pantry staples and other. I even write my grocery list keeping the categories and store layout in mind. Anything I need in the protein and produce categories goes on the bottom right of the list and everything else I list from the top left down. That way I know where on the list to look when I am the outer edge or middle of the store. I use this system to help me avoid the middle aisles that I don’t need to visit and that way I spend most of my money and time on the outer edge of the store where the real food is sold. I also am always on the lookout for a great buy or seasonal special on the perimeter of the store. Before I left on the honeymoon I had a only depleted a little of my pantry and freezer so most of what I bought this trip were fresh items, (I will write a freezer and pantry stocking list and related blog article soon). On my restocking trip like most grocery trips I start with the dairy section, eggs and milk joined sliced cheese (on sale, otherwise slice your own, better quality for the price) in the cart so I was covering both school lunches and breakfasts. I also picked up some cream cheese and sour cream to replace what we used before our trip. At about $15 the dairy section this trip was an inexpensive stop for good proteins. I think people often forget dairy is protein, don’t be afraid to serve items like quiche or even scrambled eggs for dinner. I opt to buy the slightly more expensive high omega 3 eggs but can’t make myself pay double for free range eggs since most “free range” chickens don’t really range all that free. I hope someday I might get brave and find a local farm to get my eggs from but I am not sure when that will happen. I always eat the yolks since they contain most of the nutrients in an egg, especially if you are going to spend the extra money for the omega 3 eggs don’t throw away the yolks. On we go to the meat department. Here store specials and less popular cuts are the way to go. Not that I am going to give up prime rib for the rest of my life but I am also not going to pay top dollar for grocery store quality. A local butcher normally is a better source for the luxury cuts of meat. For example at my grocery store I only buy whole chickens, otherwise I can visit my butcher at the Italian specialty market and get the butchered pieces for a lot less, much fresher. Today I was in luck whole roasting chickens were on sale, for under $10 I get a seven pound roaster that I can make at least 2-3 meals out of for my family. Pork is an often over looked meat that you can do so much with. This trip I grab bone in pork chops and a whole fresh ham. The chops are an easy weeknight dinner on the grill or in the oven for about $10 for four and the 10 pound whole fresh ham on sale at $12 will become a family Sunday dinner with aunts and uncles and grandparents joining us. I also snagged a family size package of lean ground beef that I will make of half into burgers for the grill over the weekend and use the rest for who knows what. Let’s count: that is 2 meals or more of chicken, 2 meals or more of pork, 2 meals or more of ground beef, that’s easily a week or more of food, plus leftovers!! More important than the actual meats I bought is the reasoning. Everything I bought is basic that will pair with lots of different produce or pantry staples to build a meal. I am in and out of the meat department for well under fifty bucks. And don’t forget the eggs and cheese we got in the dairy section, so at least one nice brunch is also in the basket. Thank you to the Dining section of the New York Times and photographer Tony Cenicola for what might be my favorite picture of a raw chicken ever. Watch the costs of the convenience and pre marinated cuts when you are shopping they are often skimpy cuts and not really worth the extra money. Also pre made burgers often have filler (aka pink slime) and cost more per pound than the plain ground beef. I can’t talk about buying meat without mentioning Costco, they are hard to beat in this area while the quantity might be large the prices are great. I say throw half into the freezer and shop less often. The best example I have found of this truth is pork tenderloin at the grocery store its around $9 for that little sealed up package of two, at Costco four much larger tenderloins are about $14. Now we have in the cart building blocks for meals, proteins. Yes, I know we are all supposed to be doing meatless Monday and all that but my husband (that was fun to type, I have a husband now) likes to see something meat-like at dinner and so do I. And while I can throw a vegetable quiche or pasta in the rotation now and then we are American and we like meat on the table. I also know that eating meat at every meal is not great, so I try to feed my family whole grains, dairy, and lots of produce for breakfast and lunch, no or very little meat. And since I pack their lunches for work and school this is a nice compromise. Next article on this odyssey of grocery shopping will be the produce section. Produce is where you build little meals in the cart as you shop, I try to hit the edges of store first getting the building blocks of my week’s meals before I tackle the center aisles so as I decide what each meal is going to be I can then hit the aisles for any dry ingredients that I don’t have at home and restock my pantry at the same time without back tracking. It’s my crazy system, but as my family will tell you: I have a system for everything and most of the systems are a little crazy. I also shop with a list, it’s a must! Never realized it until I read your articles that I do stick to the outer edges of the grocery store. Another thing I do to help my budget is plan my meals for the week, in conjunction weekly specials. Thanks for the nice comment, happy that you are enjoying my blog. I am having fun writting it too!